Two years ago to this day, Canonical announced the discontinuation of Ubuntu Touch. But, you know, as a valued community member, that we have all worked hard to keep Ubuntu Touch alive and the project is stronger than ever. We are proud to announce that UBports is now about to be granted the status of an official foundation that is recognized by the authorities in Berlin! The current OTA cadence isn't working with our development tooling and workflow. Let's fix that. The release of OTA-5 was a bit rough. The decision to release came too late and didn't appropriately echo through every team involved. All seems like communication problems, right? We allowed ourselves to be taken away by Target Date Syndrome. That is, while hitting your target date is important, great software is more important. We should have delayed the release rather than pushing it exactly when it said on the GitHub milestone. Even with the Ubuntu release clouding the news for the next couple of weeks, another week of development (and another of hard testing) would have been preferred to a hard push out the door. We should have made a new framework version. The OpenStore (starting today) is able to hold updates back from people who don't have a framework version. This would have solved the pain people are experiencing with the Notes app. The new features are impressive. Our browser is faster and more secure than it's ever been. New users are hearing better sounds (thanks @malditobastardo!). Upgraders are being met with a guided setup. Our Korean users have a keyboard all their own. That doesn't mean that OTA-5 is perfect. It has its bugs, and we'd appreciate if you report any you find. Some of the issues and hindsight I mentioned above are just lessons that we needed to learn sooner or later. Now that we've been bitten, we'll let the scar remind us to do right. We have a couple of options that I'll present here that should help us improve the pre-, during-, and post-release process. Week 7: Does it test okay? If any "Release OK" is not received or is denied, the release moves back to development to mend the problem. Week 8: It's done, prep for release! As always, devel ships nightly, rc (Release Candidate) ships every week, and stable ships upon completion of all of this. The reason this would be pinned to an 8-week cycle is simple... with our set of (highly skilled and totally appreciated, I must say) contributors, it isn't feasible to promise any less than this without being in a constant state of "crunch time." That isn't safe for contributors, paid or otherwise. As I type this, I find there is no reason that the week numbers must be hardcoded, though... at any point during the cycle where all major teams OK the release, it is ready to ship. When all these OKs occur, a full week is needed to complete the release. Security fixes are getting to users of Stable only every 8+ weeks. That is widely regarded as unacceptable in today's climate. The following Thursday (example October 25th), the RC image is promoted to Stable (unless there is an issue labeled critical-rc). The image is phased in over a period of 4-5 days. At most, users of Stable will be 15 days behind the current devel (Please correct me if I'm wrong... I'm not always the best with date logic). I'm open to adjusting the dates slightly as needed. If we felt it important, we could have the QA team OK these releases too. Nothing severe, just a "type the version number, check the box if no one's phone is broke". Our milestone system would move to milestones for each major feature rather than each major release, followed by Epics on GitLab for the same purpose as we slowly transition over. As parts of features land, the milestone becomes more complete. I'm not 100% sure how we'd label releases at this point... @mariogrip insists on using semantic versioning based on the API stability of the development framework. I say that we should use the week number of the devel build that creates the stable build, so someone getting the build on Thursday, the 18th of October, 2018, would receive 2018-W41. You can discuss that over here. Developers (who should be using devel, glare) are using software closer to our users. When we were nearing the end of the OTA-4 cycle, the Ubuntu Touch we were using was very different from what most people were using. Not necessarily a bad thing. Most desktop distributions I've used default to notifying users of updates every week. LineageOS also checks once per week. Personally, I'm leaning toward releasing fast... I think that the best way to release as a community is to make the computers do it instead. Depending on the methodology we decide as a community (and how fast we do it! ), OTA-6 may be released under either option. If we decide in fewer than 2 weeks, OTA-6 will definitely use whatever we decide. If OTA-6 is ready before we decide, it will be the last release before we move to the new method. ahem may we keep it on topic, mister moderator? 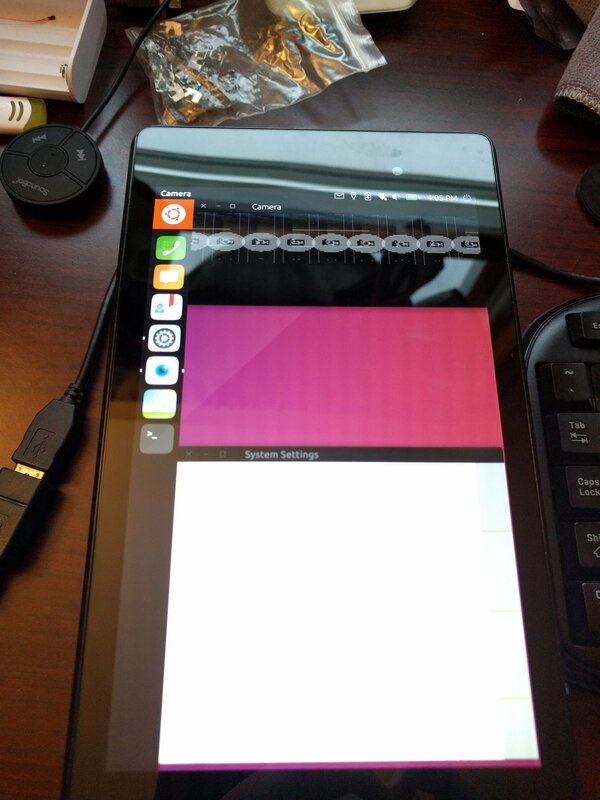 This forum is for the discussion of porting work, build errors, and other wonderful hurdles when porting Ubuntu Touch. It is not a place to ask the UBports developers to port to a new device. The devices which we support can be found at https://devices.ubuntu-touch.io. If you would like to discuss devices to port to, please consider making a topic in Off Topic. If you like to port Ubuntu Touch to your device, please see our porting documentation. Any future topics asking this question or a variant of it in the Porting subforum will be moved to off topic and locked. Thank you for understanding. Apps may only access their own data in ~/.cache and ~/.config unless they have specified it in their AppArmor config. For example, the camera app has permissions to "Picture files" and "Video files". Apps may only access hardware if they specifically request access or have it specified in their AppArmor config. The only way to access files outside of the restricted permissions for documents, videos, and picture files is to go through ContentHub. That's the system where an app asks you to select a file from another app which has access. In essence, you need to give an app the files it wants. This system is completely different than almost anything found on any Linux distribution at this point (minus Android, which the system is partially modeled after). It is also very upsetting to many Linux desktop developers for this reason. @Jackl since you're not all that interested in Ubuntu Touch anyway, maybe you'd prefer to discuss at https://forum.pine64.org/. This forum has more discussions because there are a lot of people interested in Ubuntu Touch on the PinePhone, you'll probably find similar discussions at any other partner project's preferred meeting place. Lately I've been noticing more discussions about fundamental design changes to Ubuntu Touch, Unity8, or convergent apps. I believe that these discussions should be allowed to flourish. Having them is a sign of a healthy community whose members are able to bounce ideas around in order to come to a better end result. To help frame the discussion and keep it respectful and realistic, we should continue to add to our design documentation. I'll be making a series of posts as I find the words to write them that we can later contribute to this documentation. I'm bringing them here first so we're able to discuss their content and end up with a better result. Some of the recent conversations ignore a concept which took me a very long time to grasp, but is essential to the convergence experience: Consistent, not congruent. how did you even get gesture controls to work fluidly with a mouse? This stems from the common misunderstanding that convergent interactions must be the same across all input methods and screen sizes. You might remember a rather recent project that blew up in a large company's face due to this misunderstanding. Windows 8 was widely regarded as a commercial failure that doomed Ballmer as CEO of Microsoft . It tried to make the same interface suitable for all screen sizes and input methods. A mouse can be used to smoothly move a cursor on screen. Once the cursor has reached a control, two buttons are available to select the control or activate context actions. The mouse is a relative pointing device, meaning that it "allows the application of algorithms to transform the relationship between the location of the pointing device and the cursor." In other words, the relationship between how you move the mouse and the results on-screen are not absolutely mapped. Fingers on a touch screen can make smooth swiping motions from any point on screen. They can also tap or press and hold on controls. A touch screen is an absolute pointing device, a "highly learned direct mapping between the [action] and the location on the screen that involves kinesthetic or proprioceptive cues from the body [...]". Translated to English, the result of an action is more directly mapped to the action than with a relative pointing device. Fingers on a touchpad can also make smooth swiping motions, however the touchpad is a relative pointing device. Users expect to be able to make smooth scrolling or zoom motions using the touchpad, however the primary action of moving the cursor is not necessarily a 1:1 action:result and there is a dedicated way to "Select", such as a pressing action. A keyboard is not a pointing device at all! Instead, certain keys on the keyboard may be pressed to focus and trigger controls. In our design documentation, the keyboard is regarded as a "Focus" input method. Pressing and holding on a stationary control for a second to select it feels natural on a touch screen. Clicking once feels natural on a mouse or touchpad. Tapping once on a stationary control to activate it feels natural on a touch screen. Clicking twice on a mouse or touchpad feels natural. 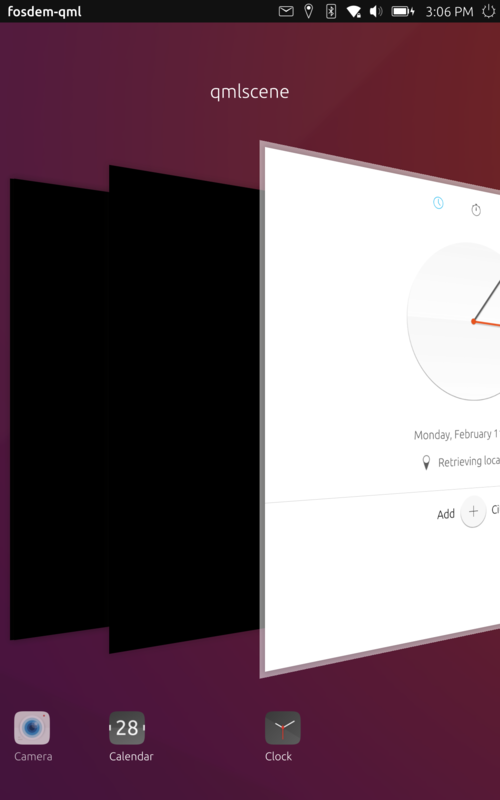 Repeatedly performing swipe actions (such as to open the launcher, drawer, or app switcher in Ubuntu Touch) is difficult with a mouse or touchpad. Instead, the same actions may be triggered with mouse "pressure" (pushing the cursor against the side of the screen, which is impossible to do with touch) or a stationary button which triggers the action (like the BFB in the upper or lower left corner of Unity8). A way to linearly cycle through the available controls on the screen must be provided for keyboard or accessibility tool users. This requirement does not map to any other input method. All of these different interactions feel like part of a whole, well-designed experience. For each input method, the user experience is internally consistent with other input methods and user expectations for their chosen method. So, we didn't get swipe gestures to work fluidly with a mouse. Instead, we made ways for the mouse to trigger the same action as a swipe gesture that is suited to its unique strengths. This is a proposal to change the UBports release workflow by adding a new "edge" channel to our rootfs builds. I'd like to know the thoughts of the people who it will affect: mainly Halium and Ubuntu Touch developers. Currently, images are promoted from devel to rc to stable. This creates a pipeline where a known good image on devel will eventually become the release image, which is overall good for setting user expectations. It also encourages developers to keep packages included into devel stable as they are candidates for promotion at any time. (most importantly) Fixing Issue 404, "Ubuntu Touch does not run on unmodified Halium" and 494, "Mir servers fail to run on devices that ship with CAF's Android for MSM 7.1"
I propose that we augment our current release channels, stable, rc, and devel, with a new channel called edge. This channel will be built daily for all devices using an edge rootfs. The edge rootfs will be built from a branch extension of xenial, possibly xenial_-_edge. This will ensure that only specifically selected packages will diverge from the normal image. edge images will not be candidates for promotion to any other channel. Instead, pull requests will be made from xenial_-_edge to xenial. After a PR has been accepted, the package will need to be removed from xenial_-_edge so that it will no longer diverge. We will be very clear that the edge channel is expected to break at any time for any device. It is for developers, not users. How is this different than using qa-scripts? The edge channel is primarily useful for Halium developers. It is much more convenient for them to download a single image and install it than the currently required hacks and reinstalls of packages. Since the channel will also be available for all devices, it provides a good testing ground to ensure that changes that fix Halium devices do not break our officially supported devices. PIA can be added normally through System Settings. I've received the instructions for doing this before, I'll paste them here. I extracted and created a folder .privateinernetaccess in the 'phablet' directory to keep all the files. The only other setting to change is under 'Security' section Choose 'SHA-1' as the HMAC authentication. This is not needed to work but it is a defined in the ovpn profile provided by PIA. Looking at the Wiki lately, I'm seeing a lot of pages in the sidebar. This is great as it provides a lot of information right away to newcomers, but it's getting a little ridiculous. I mean, look at what happens on mobile! There are also pages from before the Canonical drop that are getting stale and should be removed or refreshed. The solution to this is to reorganize the wiki. Here's my proposal. I need your help. Check the bottom of this post for the current topic of discussion for this thread and a direct link to where the discussion starts. Make navigation on the Wiki easier by reorganizing pages into categories and refreshing stale information. We will also be switching to Read the Docs for better readability, navigation, and source control. We have officially outgrown Jingo. a. Create landing pages for each category in selected category scheme. Landing pages describe and link to the correct pages for the category. Analyze our common hurdles to contributing. Document the process of getting over these. Place them in the correct category. While we work on refreshing the documents, do we want to write them in md for the wiki or just use rst and go straight to RTD? I suggest we use rst and start committing to RTD so we can bring it up faster.